The other games so far were all drawn. The festival in memory of the third world champion is being held for the 51st time. Six players are competing in a double all-play-all in the main tournament. The third round begins at 22.00 Moscow time on Saturday night, so nobody in Russia will be following it (as Russia kick off versus England at the same time). The sixth round of the Capablanca Memorial which is held in Cuban capital, opened the second cycle of the competition and was marked with only one decisive game. Ian Nepomniachtchi beat Quesada. (In the first cycle Nepomniachtchi drew all five games). Potkin - Ivanchuk and Laznicka - Dominguez finished peacefully. 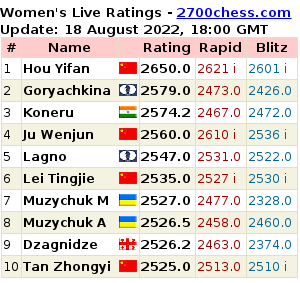 Vassily Ivanchuk maintains sole lead with 4/6. Nepomniachtchi and Dominguez stay half a point behind him. The fifth round of the elite Capablanca Memorial tournament ended last night. There was a quick draw in the game of Ian Nepomniachtchi and Leinier Dominguez. Then, Vassily Ivanchuk and Vladimir Potkin slowly outplayed Victor Laznicka and Yuniesky Quesada, respectively. More details are to follow. In Cuba, the memorial event for the great Jose Raoul Capablanca is taking place for the 50th time. 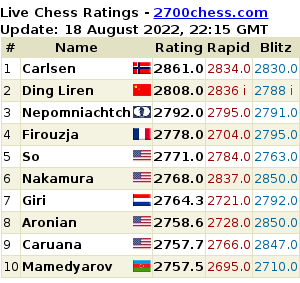 As usual, in the main, "elite" tournament, we have a double-cycle all play all with six players - a solid group of 2700s, plus Lazaro Bruzon, who slightly lags behind on rating. The penultimate 9th round of the Capablanca Memorial has finished in Havana. In general, the key game of the round Nepomniachtchi - Ivanchuk went with Russian's small advantage, who applied a novelty in a well known variation of the English opening. However, Nepomniachtchi blundered a pawn on move 47 by moving his king on f2, instead he had to check Black king, which would give him nominal chances to fight for the victory.